This item is set to discontinue once out of stock. This item is set to discontinue once out of stock. In 1/2 teaspoon of the gel (2,500 mg) you can get 240 mg of EPA, 144 mg of DHA, and 800 mg Omega 3. More nutrients per serving and product per container than the capsules. Dr. Weston A. Price discovered high vitamin butter oil in the early 1930's. The pinnacle of his X-Factor discovery was the extreme synergy between high vitamin butter oil and traditional cod liver oil. "One without the other did not do his patients justice, but the two together worked like magic." X-Factor Gold High Vitamin Butter Oil is made from dairy oil extracted without heat, from cows that eat 100% rapidly growing grass. The speed of the grass growth, timing of the grazing of this grass, species of grass, climate, and extraction method are all important to make real X-Factor Gold High Vitamin Butter Oil. The Blue Ice Fermented Cod Liver Oil brings us back in time, when cod liver oil was truly a sacred food. This Blue Ice Fermented Cod Liver Oil is lacto-fermented and extracted without heat. The fish are wild-caught in the Arctic region. The combination of these attributes provides us with a pure, clean, and nutrient-rich sacred food. 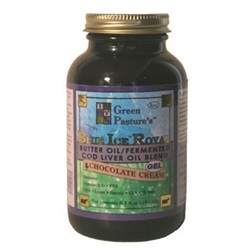 Blue Ice Royal offers us a nutrient-dense sacred food blend of 1/3 X-Factor Gold High Vitamin Butter Oil and 2/3 Blue Ice Fermented Cod Liver Oil. Please order with caution during high heat temperatures, as the product can melt/liquefy during transit.